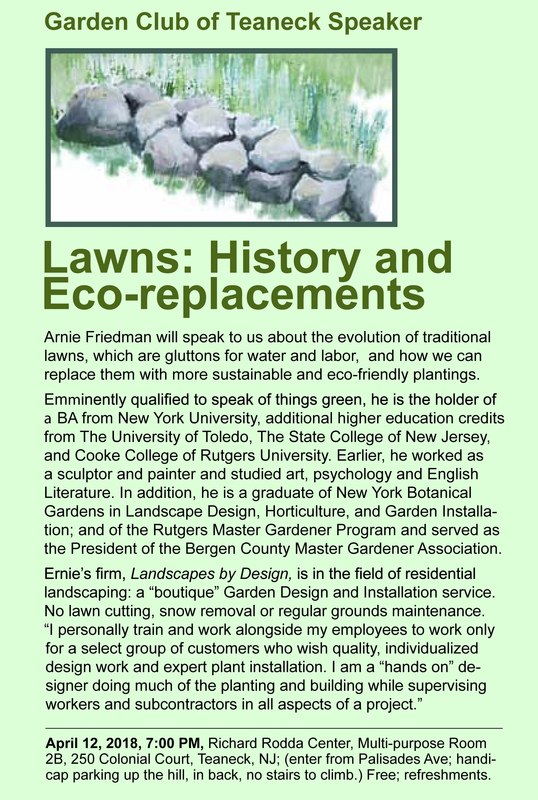 Arnie Friedman will speak to us about the evolution of traditional lawns, which are gluttons for water and labor; and how we can replace them with more sustainable and eco-friendly plantings. Emminently qualified to speak of things green, he is the holder of a BA from New York University, additional higher education credits from The University of Toledo, The State College of New Jersey, and Cooke College of Rutgers University. Earlier, he worked as a sculptor and painter and studied art, psychology and English Literature. In addition, he is a graduate of New York Botanical Gardens in Landscape Design, Horticulture, and Garden Installation; and of the Rutgers Master Gardener Program and served as the President of the Bergen County Master Gardener Association. Ernie’s firm, Landscapes by Design, is in the field of residential landscaping: a “boutique” Garden Design and Installation service. No lawn cutting, snow removal or regular grounds maintenance. “I personally train and work alongside my employees to work only for a select group of customers who wish quality, individualized design work and expert plant installation. I am a “hands on” designer doing much of the planting and building while supervising workers and subcontractors in all aspects of a project.” April 12, 2018, 7:00 PM, Richard Rodda Center, Multi-purpose Room 2B, 250 Colonial Court, Teaneck, NJ; (enter from Palisades Ave; handicap parking up the hill, in back, no stairs to climb.) Free; refreshments.